LAST GAME 9/19/10: Jaguars 13 at Chargers 38. San Diego scores 24 unanswered points, including 2 TD catches (9, 4) by TE Antonio Gates in 2nd quarter from QB Philip Rivers. LAST GAME AT SITE 11/18/07 Jaguars 24, Chargers 17. Jacksonville QB David Garrard passes for 2 TDs as defense limits San Diego to 79 rushing yards & has 2 INTs. BROADCAST ESPN (8:30 PM ET): Mike Tirico, Ron Jaworski, Jon Gruden, Sal Paolantonio (Field reporter). 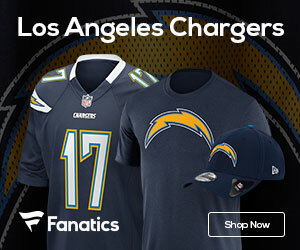 Westwood One Radio: Kevin Harlan, Dan Fouts, Tony Boselli (Field reporter). SIRIUS: 88 (WW1), 92 (SD), 93 (Jax.). XM: 88 (WW1), 225 (SD), 226 (Jax.). CHARGERS: Since ’06, SD is 20-2 (.909) in Dec…For career, QB PHILIP RIVERS has 40 TDs vs. 13 INTs & 100.7 rating as starter in Dec. Rivers (3,211) needs 289 passing yards to reach 3,500 for 4th consecutive season. Rivers completed 22 of 29 passes (75.9 pct.) for 334 yards with 3 TDs vs. 2 INTs & 119 passer rating in last meeting vs. Jax. Rivers has 5-3 record on MNF…RB RYAN MATHEWS had career-best 137 rush yards last week. RB MIKE TOLBERT had 82 rush yards with 2 rush TDs in last meeting vs. Jax…TE ANTONIO GATES (7,468) needs 65 receiving yards for 3rd-most receiving yards in franchise history (GARY GARRISON, 7,533). Rivers & Gates have connected on 46 TDs, most TDs among QB-TE duo in NFL history. Gates has 5 TD rec. in past 3 vs. Jaguars…WR VINCENT JACKSON is averaging 18.8 rec. yards per game in ’11 (44 rec., 825 yards)…CB ANTOINE CASON had career-high 2 INTs in only meeting vs. Jax…S ERIC WEDDLE is 2nd in AFC with 5 INTs in ’11 (KYLE ARRINGTON, 7)…JAGUARS: Club is 2-0 at home vs. Chargers…Rookie QB BLAINE GABBERT (No. 10 overall) registered 1st win as starter on MNF vs. Ravens in Week 7…RB MAURICE JONES-DREW leads AFC & ranks 2nd in NFL with 1,040 rush yards in ’11 (LE SEAN MC COY, 1,050). Jones-Drew has rushed for at least 80 yards in 10 of 11 games in ’11. Since ’10, Jones-Drew averages 94.6 rush yards per game, 2nd-best in NFL (ARIAN FOSTER, 96.8). Had season-best 67 receiving yards last week…TE MARCEDES LEWIS (2,505) surpassed KYLE BRADY (2,500) for most rec. yards by TE in Jaguar history last week. Had 5 catches for 70 rec. yards (14 avg.) in last game vs. SD…C BRAD MEESTER (172) surpassed JIMMY SMITH (171) for most games played in franchise history last week…CB ASHTON YOUBOTY had 38-yard FR-TD last week.